How cheerful is this cake with its pretty paper filigree topper and extraordinary fondant flowers?! Nancy Park of So Happi Together, an event design and coordination company in California, quilled the lovely topper and ribbon band embellishment. She credits her cousin-in-law, who Nancy visited while in Korea seven years ago, with introducing her to paper filigree. Nancy says that quilling satisfies her love of paper, crafts, and beautiful things in general. She stocked up on books and supplies in Seoul and returned home, ready to use her new-found interest for scrapbooking, cards, and small gifts. Nancy has tried both a slotted tool and needle tool, but prefers to roll coils with just her fingers. Kayla Lee, of Kayla's Kakes [edit: site no longer available] in Fullerton, California, made the layer cake and embellished it with perfectly quilled fondant flowers. A rolling pin and X-Acto knife were her main tools, along with a flower cutter (for gumpaste use) to create a few of the flowers. The majority however, Kayla rolled by hand. Something tells me she would be a natural at paper quilling. Look - there's even a tiny fringed flower in the mix! Kayla said that after considering ideas for the cake in her head for a week or so, it took just a couple of hours to do the actual construction. True to form, the most time consuming part of a project like this is creating an eye-catching design. And don't miss the beautiful ball of white paper flowers that's pictured above the dessert table. It was made by Jane Jeon of Olive Hue Paper Goods. 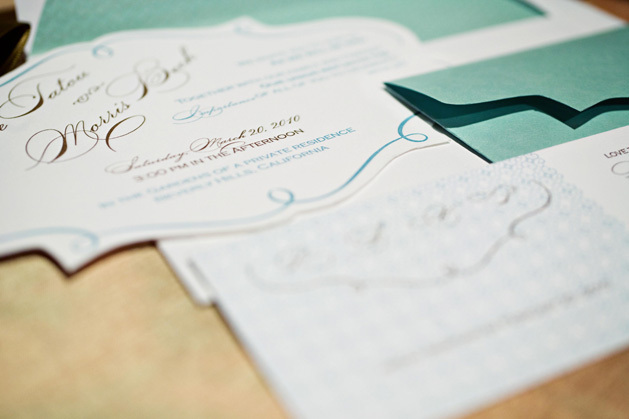 Jane is also responsible for the elegant stationery designs that are featured in the article. It's exciting we're on the cusp of wedding season once again! I look forward to featuring more paper ideas in the coming months that can be included in wedding decor. Absolutely beautiful! And I love that ball of white paper flowers. That is just beautiful. Too bad I don't know of anyone getting married, this is such a great idea. Thank you for the post Ann!! Melissa: Thanks! I had so much fun making them!! Oh, what a lovely cake!!! It's terrific! Ann! Thank you so much for the feature on your lovely blog! I am thrilled that you like our ideas and designs. xoxo!! This is just lovely. So fun but still sophisticated! So wonderful and so very inspiring , thanks for sharing. You never cease to amaze me with the paper-related stories in this blog. Keep up the good work! Oooo that gives me an idea for polymer clay! Thanks! The cake looks gorgeous with those quilled beautiful flowers! My daughter is getting married and she absolutely loves this cake and quilled topper. Do you by any chance sell this topper so that we could purchase it and have it sent to Canada? Thank you so much. You are so creative and talented. Thanks everyone - I'm glad you enjoyed the feature. Debbie, I'll forward your message to Nancy Park of So Happy Together, as she's the one who made the beautiful quilled topper.